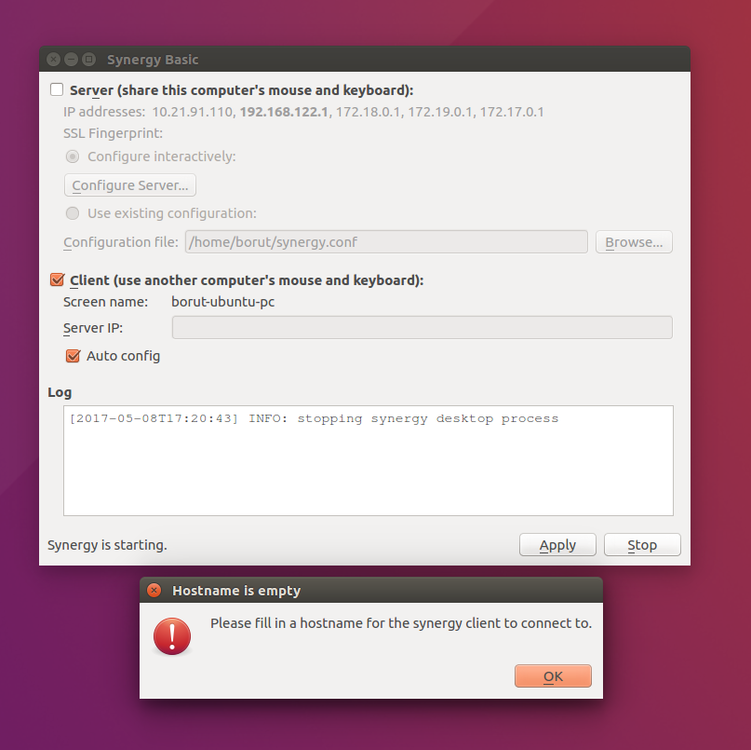 When I installed the app on ubuntu, and wanted to start it as a client, I always get "Please fill in a hostname for the synergy client to connect to." when the "Auto config" is ticked. The "Server IP" input is disabled and empty. When I untick the "Auto config", the input gets enabled, but I think that's somehow not the point of the "Auto config" functionality I would like to have. Hi @Borut. Please send us a screenshot of the Synergy interface on that machine. Thanks! That's because your machine has a lot of network adapters enabled. It would be best for you to enter your server's IP address on that Server IP box for it to properly look for the server on the right adapter it has connection to. Is this to say in other words that Auto Config works better if we manually configure unwanted adapters by disabling them? Hi @Borut and @d. What I really meant was, it is normal for the IP box to be graded out once the Auto config is ticked. That's because Synergy will automatically select which interface to connect to once Auto config is enabled. FYI - I just had this happen and realized I was on the wrong wifi network, so it couldn't see the server. So this error you posted, essentially means the auto-config failed because it couldn't find a server. Actually it shows that it is working since it can't see your machine on any of those networks you are connected to before. That's why it wanted you to manually put it in since the other machine is not existing to any of those network you are connected to initially.